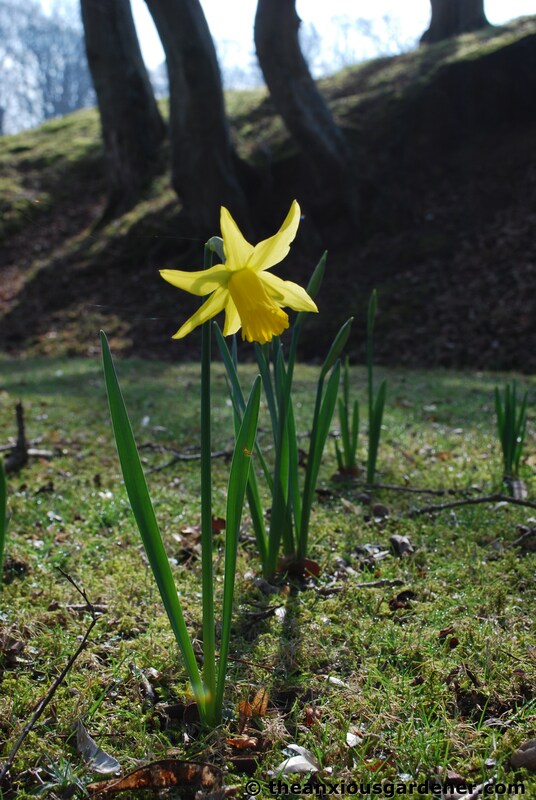 The very first daffodil in the garden, February Gold appeared on 1st March. Tut. 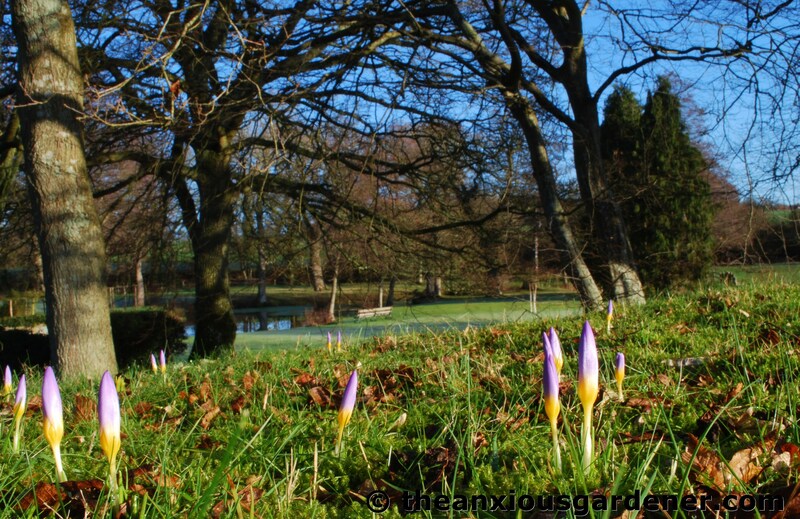 … and several hundred crocuses as, again, there weren’t any when I started. There are eleven different varieties but I’m afraid I haven’t got photos of them all. Some have been in since autumn 2008 and are beginning to spread. Some are targeted by squirrels and faltering in their conquest of the gardens. They are ephemeral certainly and gone all too quickly. So get down on your knees, get up close and make the most of them. Eventually, I would like the bank below the greenhouse to be smothered in crocuses. Though they will always deserve individual attention. … whose stripey, plump form puts me in mind of a waistcoat; stretched tight over Mr P’s rotund stomach. 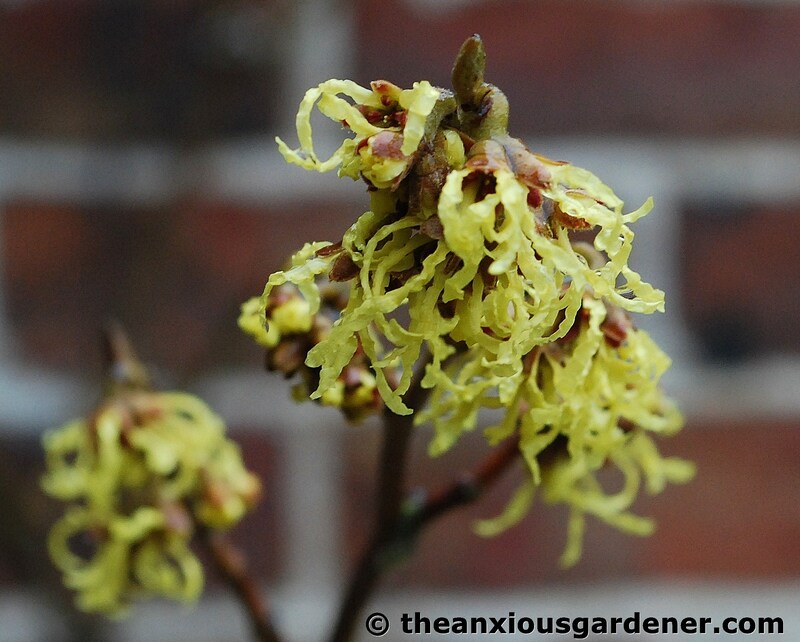 Bulbs aside, and also flowering now, is Hamamelis x intermedia ‘Arnold Promise.’ I bought this three-foot shrub for a fiver! I was very pleased with myself. The scent is heady and makes me swoon. 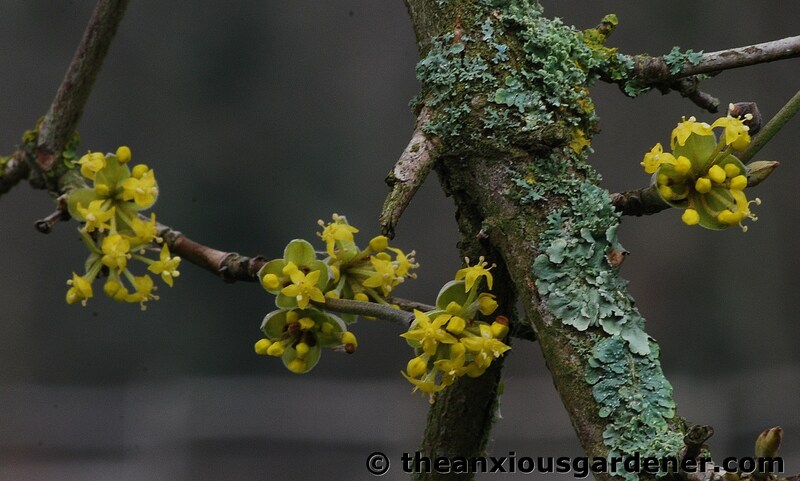 The subtle, little flowers of Cornus mas are also out. Thanks to Stacy who’s recent post, prompted me to join in. You can too! You have as much a talent in writing as you do photography, and gardening for that matter. I enjoyed the post, it was very dream like. Got a kick out of your story of leaving the priory one day, kicking and screaming. Keep your eyes peeled, the white van drives the country side looking for lunatics like us, I think the feds give them a shiny nickel per pickup. 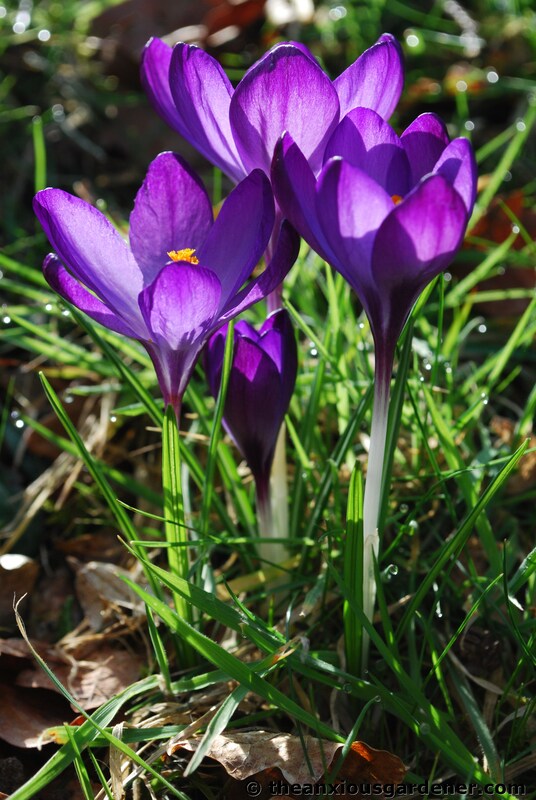 Dave – Your photos of crocuses in the grass were exactly what I had in mind when I decided to plant crocuses in my lawn. (It looks like you had to lie in the wet grass to take some of those shots.) Unfortunately I didn’t plant enough and spread them too widely. As one blooms another dies, so from a distance I can hardly see them. Never mind – I’ll look at yours and Stacy’s instead. Yes, I’m used to soggy knees but on this occasion had a soggy tee-shirt too. You obviously have done the same to realise! Even widely spaced, they should, over a couple of years, begin to fill the gaps – though as I mentioned squirrels do dig up some, and halt their progress. 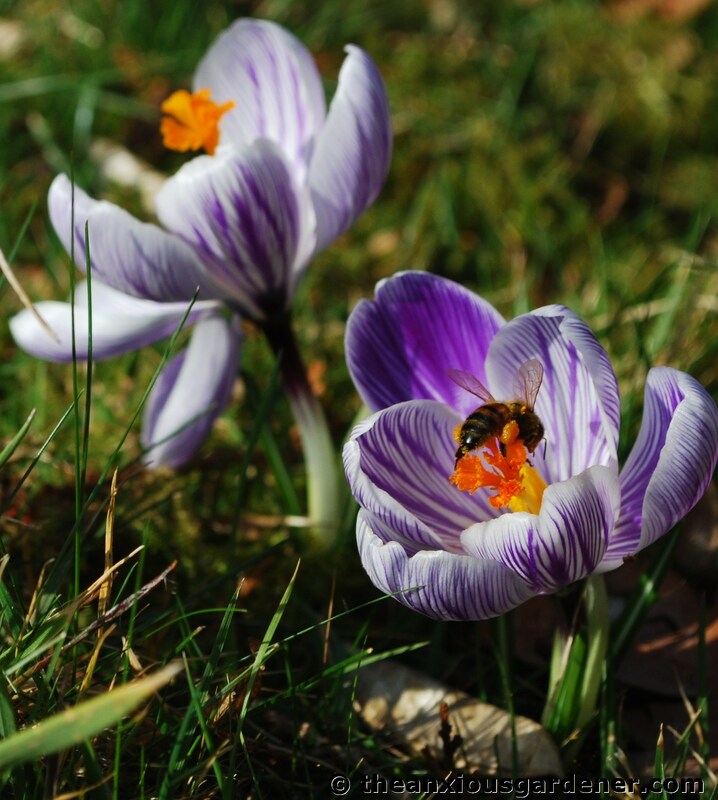 Lovely, I like the mauve and white striped crocus, too, and the bees are clearly grateful for all those lovely flowers at this hungry time of year for them. We’ve only ever had a pheasant in our garden once, over a period of a few days, strangely just after a visit to Lincolnshire where we’d seen a flock of pheasants land to eat leftover chicken feed – it must have hitched a lift on the car roof without us knowing. 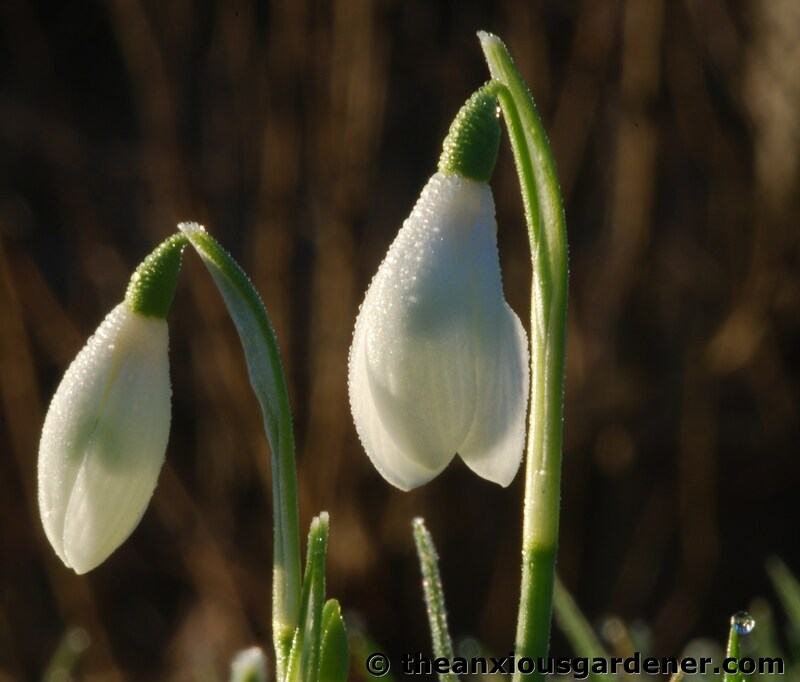 What I’d really like to know is the secret to growing snowdrops. I think they need moist conditions, but do they prefer full sunshine or a bit of shade. Do they grow in flower beds or are they only happy in grass? I don’t seem to have much luck, but I tend to buy a pot or two from the garden centre. Hi Karin, the pheasants do a little damage in the garden but they are so funny, I don’t begrudge them at all. The one in the photo was worryingly tame (considering its likely fate) and I was able to crawl up to it and take the shot with a standard lens. Thanks for that Dave, I’ll see what I can do – our garden is on a slope with a certain amount of clay and it dry out in Summer, although it doesn’t usually get too waterlogged in Winter. 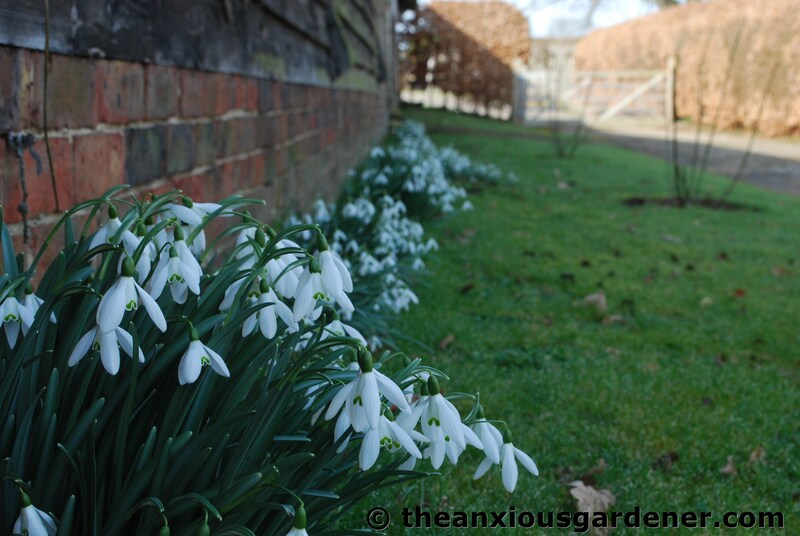 If I have a wonderful display of snowdrops next year I’ll put a photo on my blog, you can be sure. Never mind Mr P, that’s a stunning waistcoat that the pheasant has on too! The spring sunlight does just bring out beauty; pheasants are so common that we forget just how beautiful they are. Come over to the stripey side, Sara – you know it makes sense. What an enchanting garden you work in, Dave. What a lucky man you are to be caretaker of such a space! 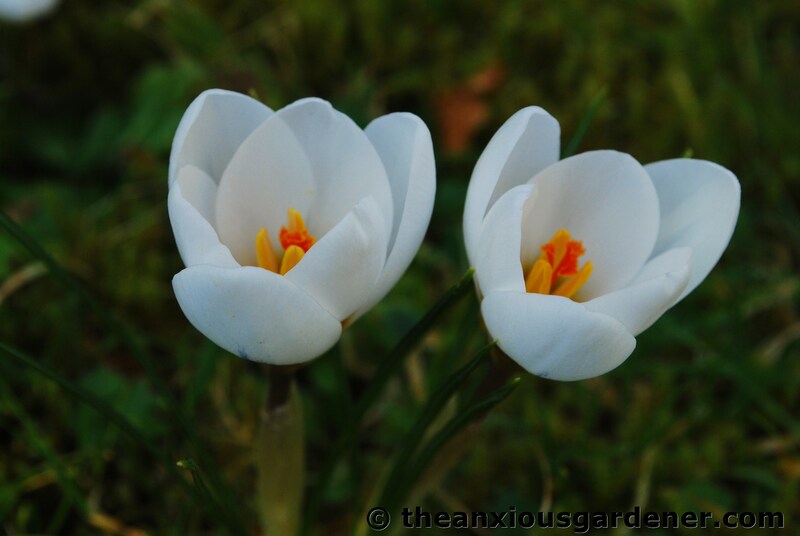 The photos of the crocuses turned towards the sun and their delicate markings are exquisite. In my imagination i see “a host of golden daffodils” . Are there still to come and if not do these generous Priory owners give you a big budget for future plantings? Hi Janet, loads and loads more daffs to come. The Feb Gold was literally just the very first individual flower of any of the many varieties. Like I say, I have planted thousands and wanted to see the effect this year before considering planting any more. But even planting in big numbers, with such a large place, they can still look a little sparse. They really need years, of course, to start forming clumps and to start looking established. Beautiful pictures! I think I like your Pickwick the best, too. Something about those stripes – such delicate detailing. Thanks Holley, I am a bit of a soft touch for stripey flowers. It is nice to know when your’e planting bulbs and trees that you’re creating a legacy for people to enjoy in the future. Life is pretty transient now so I like how gardens and plants create a feeling of permanency. That long row of snowdrops is beautiful. 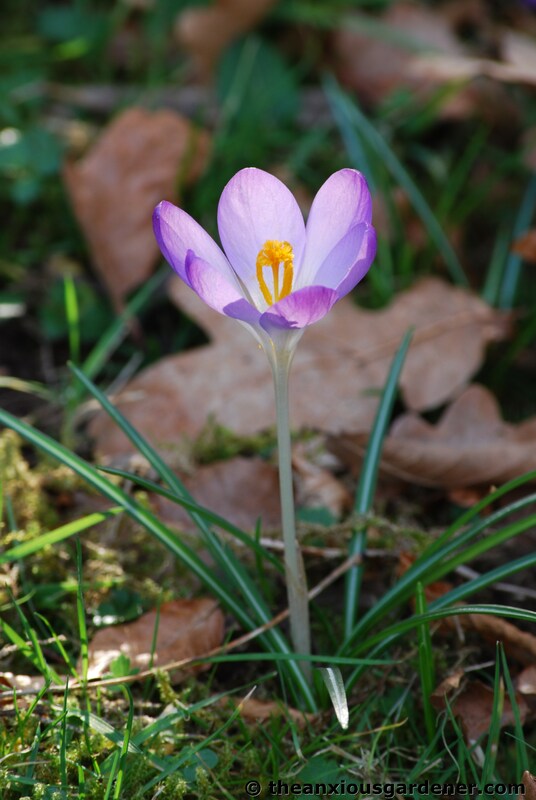 Somehow I was sure that any crocus photos of yours couldn’t possibly disappoint, Dave… How gorgeous. If there’s one thing I envy you it’s that beautiful, gentle English sunlight. (Also perhaps a little of the rain and greenery and mild winter “we can grow anything here” climate. And a few of those six acres, preferably with oak trees attached. But mostly it’s the sunlight.) 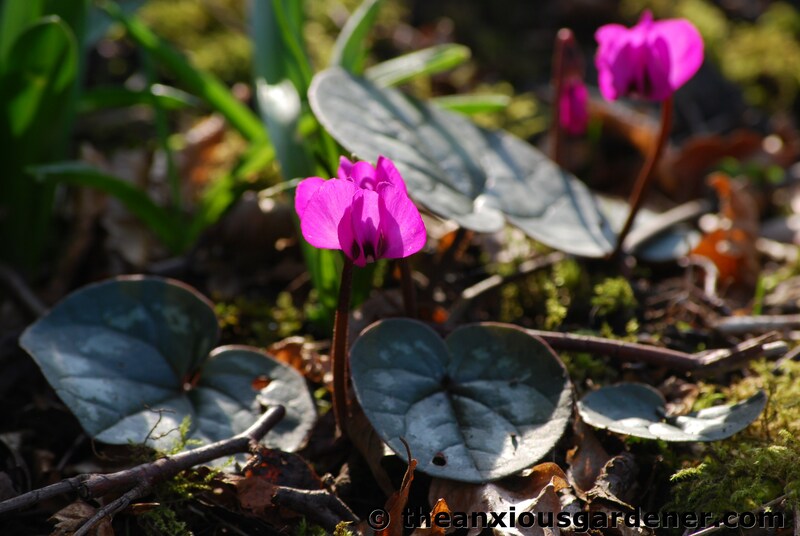 Now instead of wandering around in the garden with my morning tea I’m sitting here with my Brent & Becky’s Bulbs catalog open to the crocus page looking for Prins Claus and Pickwick. One of my favorite things about crocuses is the shading of colors where the stem meets the flower, and those two are just entrancing. Are all the vernus types so chubby, or is it just Mr. Pickwick? 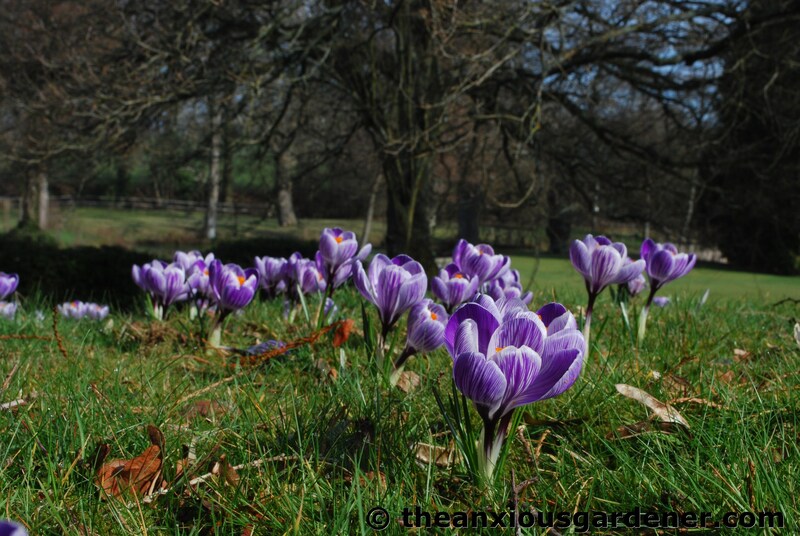 Thanks so much, Dave, for joining in with a crocus (and other beauties) post. I feel guilty now, Stacy for denying you your morning stroll with mug of tea in hand. Do Brent and Becky (what a thoroughly nice name for a bulb supplier) have Pickwick and P Claus? I do hope so, as they’re both a good choice. 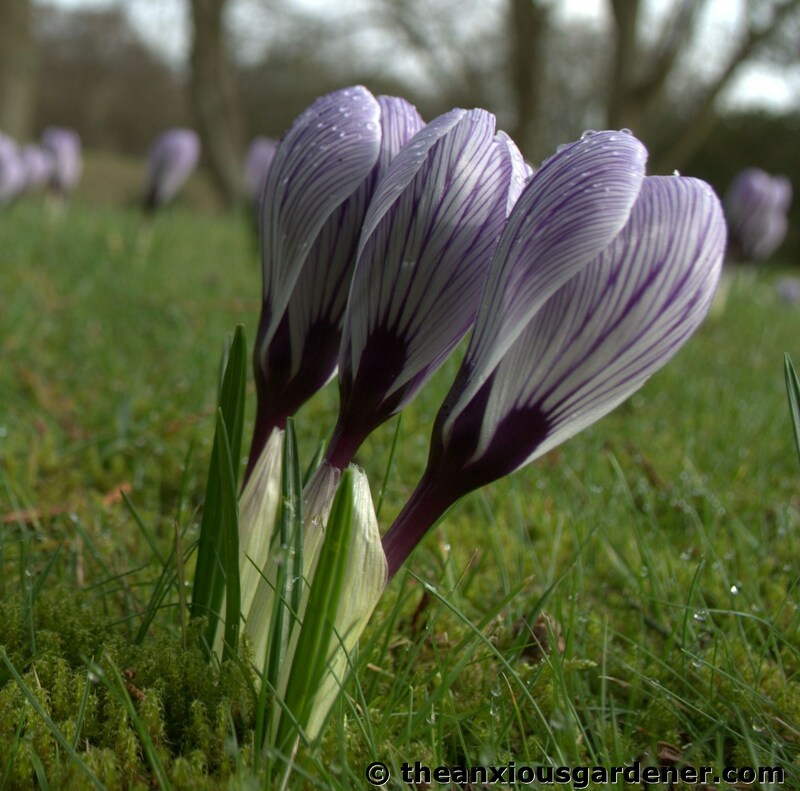 I’m afraid I don’t know the answer to your crocus question though – sorry to disappoint. 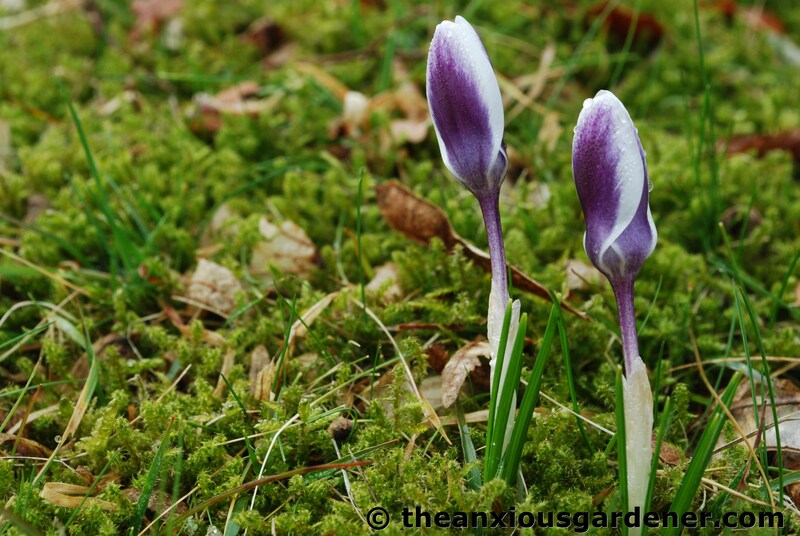 I fear you have mistaken me for a crocus expert! Brent and Becky’s catalog is also thoroughly nice, with pictures of their grandchildren and everything. They didn’t have Pickwick or PC, but one of my favorite local nurseries does, so all is right with the world. Looks like you’ve made a good start on your legacy. 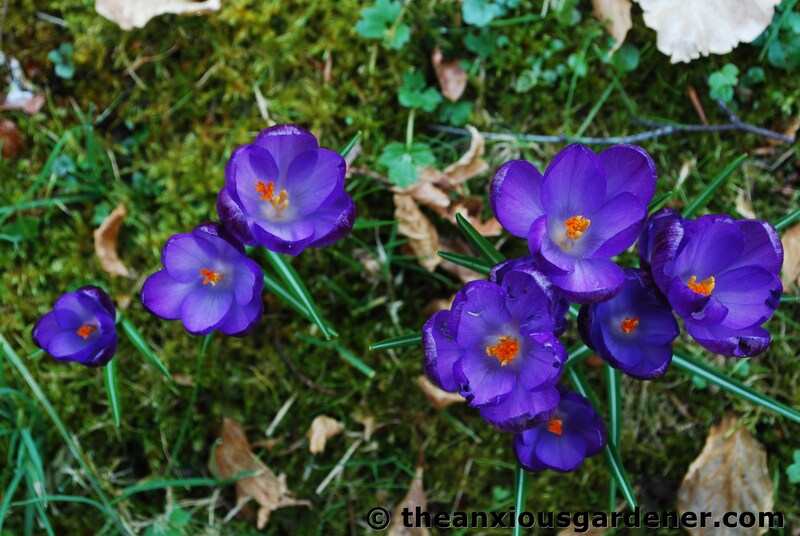 The dark purple crocus is my fave, being a lover of all things purple. Stunning spring flowers! One of the best things about having all this space to play with are drifts and swathes of spring flowering bulbs. Lovely!